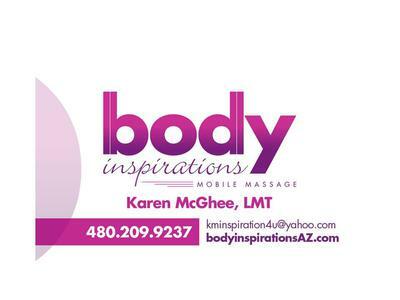 I founded Body Inspirations Mobile Massage in 2003 with the vision of a massage experience that would heal the body, mind, and spirit. One that would allow the client to relax in their own home, hotel, or office. No more running and stressing to get to your appointment! Helping others has always been my passion, and I had worked with individuals with special needs for years before moving to the southwest in 1997. I enjoyed the healing energy of the desert and went on to graduate from the Phoenix Therapeutic Massage College in Scottsdale, AZ. This intensive program demands over 800 hours of hands on practice before graduating. I continued my education by studying at the Southwest Institute of Healing Arts in Tempe, where I completed the Mastery of Myo Therapy. I’m certified by the State of Arizona Massage Board. In addition to mobile services, I’ve worked in several spas and wellness facilities throughout the Valley, working with clients seeking relief from chronic pain as well as those who value the power of touch in healing injuries or stress management. Massage therapy is a wonderful self-healing tool for the body. It helps the body’s organ systems continue to function at optimal levels. Increasing healthy circulation, reducing inflammation, massage releases unwanted toxins from the body. In today’s stressful world, it only makes sense for the mind, body and spirit!